“Labor creates the world.” The world is changing with each passing day. Because of the creation of labor, we have today’s achievements and brilliant. On the evening of June 1, the 2018 labor model award ceremony of health care was held in Huanggang Winner industrial park. The ceremony honored 31 workers from various subsidiaries, as well as Hubei provincial, municipal and May Day labor MEDALS. At the same time, Huanggang Winner industrial park has won the honorary title of “national worker pioneer”, and won the national recognition in “creating first-class work, first-class service, first-class performance and first-class team”. Mr. Li jianquan, President of the company, Mr. Yin wenling, vice President, general manager of the company’s subsidiaries, head office of the company and some leaders of the company attended the ceremony. Mr. Yi xianrong, member of the standing committee of Huanggang municipal committee of the CPC, minister of the municipal united front department and chairman of the municipal federation of trade unions attended the award ceremony. 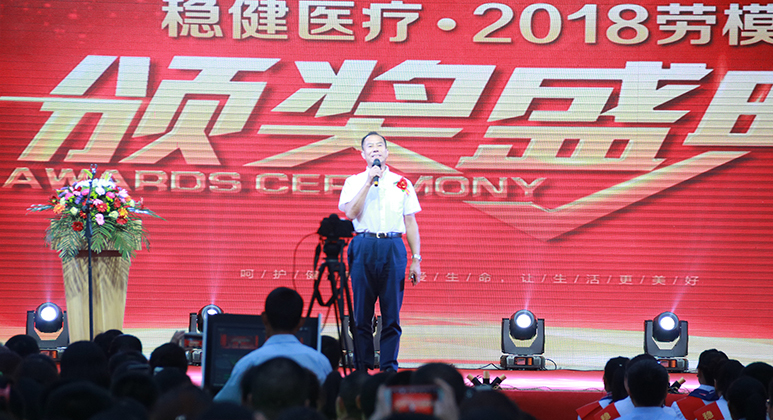 The award ceremony was held at the award ceremony of the national workers vanguard. On behalf of his colleagues, Mr. Qian xingfu, general manager of Huanggang Winner, extended a warm welcome to all the models, leaders and guests. In addition ,he took the opportunity to think about good future of Winner medical group and Huanggang Winner. Subsequently, Mr. Li jianquan, President of Winner Medical group, addressed the ceremony. President li first of all very humorous for all people send blessings, I wish you a happy “children’s day”! I also congratulate all the winner models and encourage everyone to follow their example! In his speech, President Li explained the importance of striving, persisting, innovating and keeping pace with The Times, and urged everyone to pay attention to consumers and the market, and constantly create products that consumers love with the innovative consciousness and wisdom. Hu hong and 31 others were awarded the honorary title of “model worker of Winner Medical group ” in the current awards meeting of winner model. 31 stable people in the ordinary post, with their own diligent hands and dedication heart, in their own post deduces a positive and enterprising story! Let us see the spirit of winner striving upward, the determination to pursue their dreams and the spirit of the craftsman striving for excellence. The end of the festival is the beginning of the transmission of the spirit of the model workers, the award ceremony of the model workers to promote and spread the spirit of love and dedication, striving for first class, hard work, the courage to innovate noble character, and will spread in every corner in Winner, from the excellent to the outstanding!